I grew up in a household (in the 70’s) with a mother who believed in taking vitamins. Known today as supplements. At that point my mother recommended multi-vitamins. Just to ensure that we were getting the proper nutrition. After a while our “vitamin” taking grew into vitamin C, vitamin E and Iron. Afterall who knew what we were really getting from our food. Since those days supplement usage has grown exponentially. We, as a society, now take many different “vitamins”. 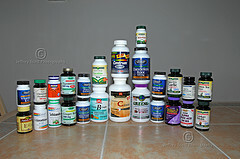 From yes, Multis, C’s, E and now add on to that list, fish oil, selenium, calcium and the list goes on and on. You can find a pill or liquid on the market to satisfy your needs whether it is to fight off the possibilities of a cold, aid in bone health or even help you grow muscle. Oooops let’s not forget hair too. Before we go to far know this. 17 years ago legislation was passed that allows supplement manufacturers to make claims without any federal regulation. In other words, if they want to, they can lie. Recent studies have surfaced that dispute the use of these health aids. In fact it seems for every study that you find that professes a pill’s positive effects. There’s sure to be another in the month’s to follow that debunk it. But as usual we are told that vitamin E is going to help us maintain our health so we include it in our supplements. Population studies (large groups of people over time) suggest that eating foods high in vitamin E may help prevent cancer. But several large clinical studies found that women who take vitamin E supplements do NOT have a lower risk of breast cancer. And another study found that men who took 400 IU of vitamin E every other day for 8 years did NOT have a lower risk of overall cancer than those who took a placebo. Many population studies have found that people who have higher levels of vitamin E have a lower risk of heart disease. Now the counter. The Heart Outcomes Prevention Evaluation (HOPE) trial, found that taking 400 IU of vitamin E did NOT lower the number of heart attacks, strokes, or deaths from heart disease from men and women who were at high risk for it. In 2004 researchers at Johns Hopkins reported that a high-dose of vitamin E (in excess of 400 IU) is associated with a higher overall risk of dying. 19 studies took place between 1993 and 2004 and involved more than 136,000 patients in North America, Europe and China. All of the studies included a control group taking a placebo. When the data was re-evaluated, high dose vitamin E (400 IU per day or more) showed an increase of death. While doing the research on this I checked out my own cupboard and looked at the multivitamin that was in there and found that the dosage was 200 IU per day. I have to wonder that along with the foods I’m eating if I’m actually getting 400 IU or more a day. Or maybe, just maybe I should just rely on eating well balanced meals and put the supplements away. I don’t have an end answer here. My suggestion though especially since there are NO regulations on supplements is, buyer beware! You have to be comfortable with your decisions but please do your own research on what you are putting in your body. Several years ago I was training a teenage male and during the session he proudly announced to me that, that morning he had taken a bunch of vitamins. I asked him why. He just shrugged his shoulders.